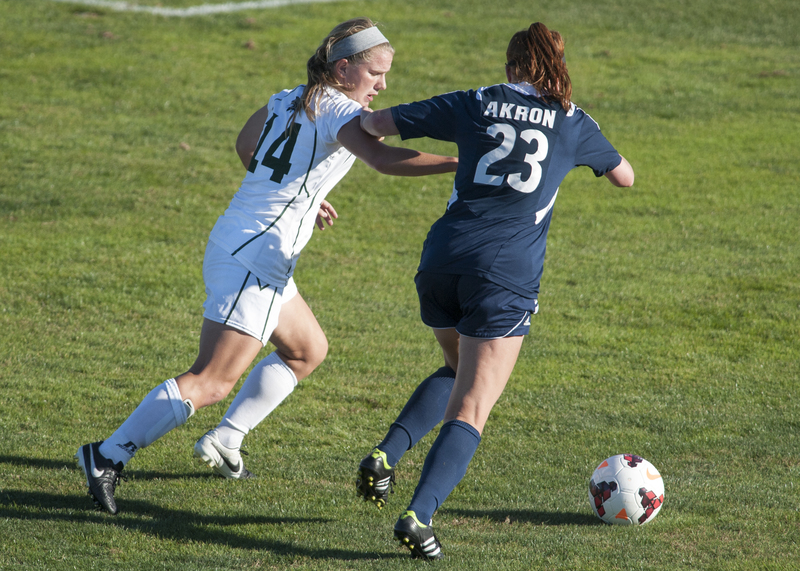 Ohio defender Mollie Whitacre (14) looks to stop Akron’s attack. Photo by Carl Fonticella. After beating Akron, 3-1, on Friday in their MAC opener and losing in double overtime to Buffalo, 1-0, on Sunday, the Ohio Bobcats will play their first two away games of the MAC season this weekend. Ohio will face Western Michigan on Friday at 4 p.m. before it plays Northern Illinois on Sunday at 1 p.m. Despite losing with less than two minutes left against Buffalo, Ohio sophomore defender Mollie Whitacre was pleased with the way the team played last weekend. In the corresponding games last season, Ohio tied Western Michigan at Chessa Field, 0-0, and it lost to Northern Illinois, 2-1. When Ohio played Western Michigan (8-2-0, 2-0-0 MAC) last season, it conceded a lot of the possession of the ball and stayed organized defensively, which dared the Broncos to try to break them down and score goals. On this occasion, Rodgers wants his team to take initiative and control the game. Rodgers is looking to use his preferred 4-diamond-2 formation this weekend, but that could change depending on what formation Northern Illinois uses. The Huskies could potentially use a 3-5-2 shape or a 4-4-2 formation. Depending on what Northern Illinois does, Rodgers could use a 4-3-3 system. Traveling on the road for a weekend will present a few challenges for Ohio (4-6-0, 1-1-0 MAC). For Whitacre, a couple of those challenges stand out more than others. Western Michigan has won its last three games and has not allowed a goal at home so far this season; Northern Illinois (4-6-0, 2-0-0 MAC) has won four of its last six games and is 2-2-0 at home this season. If Ohio is to earn more points this weekend, it will have to make its mark offensively.